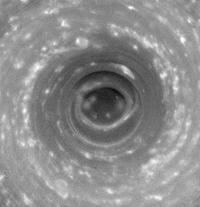 (Source: NASA/JPL/Space Science Institute) "NASA's Cassini spacecraft has seen something never before seen on another planet -- a hurricane-like storm at Saturn's south pole with a well-developed eye, ringed by towering clouds. This 14-frame movie shows a swirling cloud mass centered on the south pole, around which winds blow at 550 kilometers (350 miles) per hour. The 'hurricane' spans a dark area inside a thick, brighter ring of clouds. It is approximately 8,000 kilometers (5,000 miles) across, or two thirds the diameter of Earth. 'It looks like a hurricane, but it doesn't behave like a hurricane,' said Dr. Andrew Ingersoll, a member of Cassini's imaging team at the California Institute of Technology, Pasadena. 'Whatever it is, we're going to focus on the eye of this storm and find out why it's there.'"